We already discussed this item, but I made some extra photo's which perhaps show more details to form your opinion. 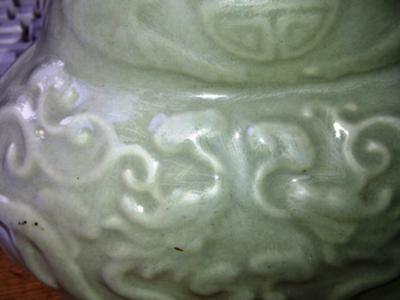 One shows the side of the vase and one shows the body where a glaze contraction can be spotted. And another one gives a better sight on the bottom of the vase. 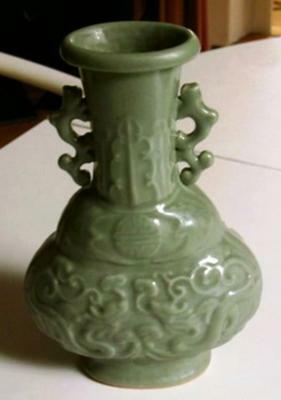 You may note that the glaze of the vase is damaged in certain places. I would be interested in seeing a closeup of the bottom. with good details, including the mark. Maybe this provides some more decisive hint??? Please don't think that glaze contractions are significant for deciding age. If you check the section under 'Porcelain Age Signs' you will see a description how they develop. Because I originally also thought they are valuable for deciding age, I put now special emphasis on the fact that contractions can only be indirect age signs. This cannot be emphasized enough. They may or may not support the findings of an age evaluation. 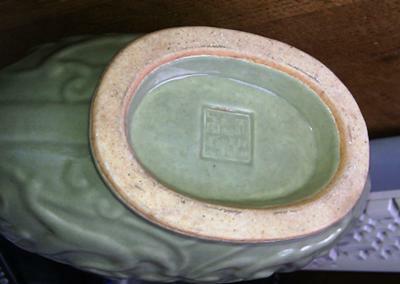 They can also appear in later porcelain and are indicative of the kiln conditions at the time of manufacture only. But, they are very unlikely to appear on Yongzheng-Qianlong period porcelain. The reason I believe it is not antique is its complex decoration. But, don't take this as a definitive answer. This is my personal opinion...it is always better to ask more than one person. Last week I did show a plate to an experienced collector here; one of my plates with superb decoration. Some two years ago I was told by another collector/dealer in a Chinese Internet forum that the plate could not be of the period I thought, and that it was more recent or new. Well, it turned out to be 18th century. I know that the guy in China knows his stuff, but this only shows that everybody knows more in some areas and less in others. Just hold on to the vase. There will come a time when you have a better opportunity for checking its authenticity.